The change of makers each month is coming around with extraordinary speed, or is this just the perception of an ageing curator? Nevertheless, we have an exciting mix of styles and making techniques that will hopefully maintain your interest in what is happening at Bevere and in the world of studio ceramics. Hyu Jin Jo was at Bevere the first time in one of our Graduate Shows – her work was certainly highly regarded then. Now living and working in South Korea, she has built on her well-developed skill base to produce work which combines the contemporary with the traditional oriental. There is a simple elegance of design underpinned by her evident making skills. This is work which will sit comfortably in any context – always an indicator of good design. 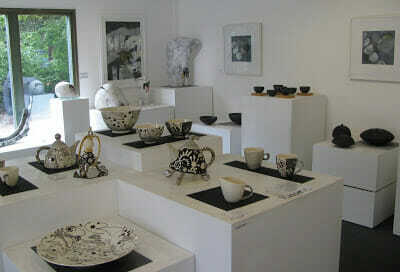 Delighted to be showing her work here again. Lara Scobie will be known for her previous shows here. Based in Scotland, this skilled maker in porcelain has high level design and decorating skills which give her work such a distinctive voice. She often uses simple line drawing to exceptional effect. For her, it is the balance between composition and form, absence and presence, that offers some of the most exciting opportunities for expressing her creative voice. 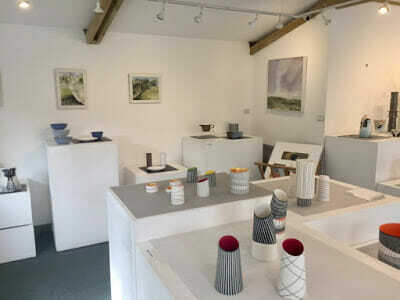 Add to these the range and diversity of other makers in the gallery and as always it should be an enriching experience. First class service. Good choice of materials. Good advice and pricing. Wonderful ! Great place to visit. I've had several pictures framed here over the last 2 years and highly recommend their service. 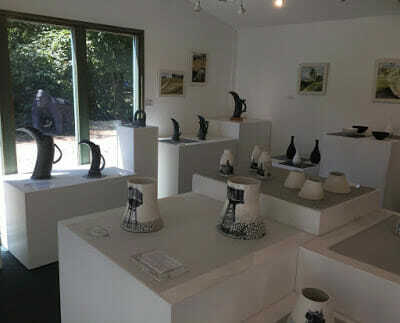 The gallery staff are patient and friendly while providing helpful advice. Lovely cafe with homemade cakes and interesting menu. Gone off it. Used to be a great gallery with tea rooms. Now a cafe with a gallery. Sculpture trail is no more. Taken off our go to list. Small cafe there with surprisingly good food and a wide selection of it. Relatively cheap for its high quality. The framing itself was very well done and the art there is interesting. Well worth the money.